Very nicely done and quite inspirational - now I'd like a Viking army! I'm with Nick! Very nice work. Nice to see these. As usual very well done. I like the 3 fig 30mm base idea. Should've thought of that, Doh! 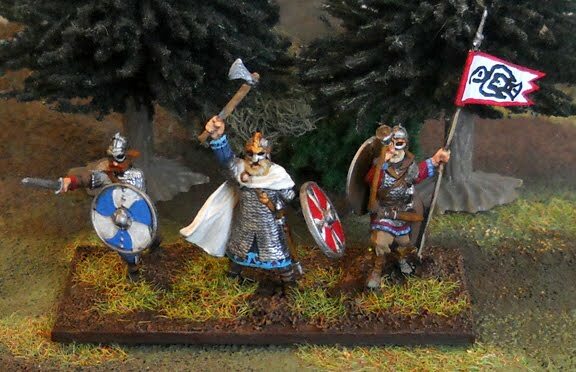 I want to do a Dark Age Scotland series of 5 armies, but can't make my mind up what scale to use. Your Vikings are pushing back towards plastics! Wow... those have to be some of the nicest 1/72 plastics I've ever seen! Nice dynamic poses and some nice detail (brought out by an excellent paint job!). Well done! I am curious why, when you went with deeper bases, you chose to use less figures? My whole reason for using the deeper bases was to fit more figures on a base to make them look more like a "unit". I know others that have adopted deeper bases just so they can fit the proper number of larger 28mm figures on, or to create dioramas. Thanks dudes. (Now you're making me feel bad that I don't have enough models) I only based 3 because I like how it looks. I felt like 4 figures would be really crammed, even with the added depth. And it kind of make sense that a small raiding party of vikings wouldn't have a dense formation. If I do an army like the Romans, then I'll make sure to fit in a close formation of 4 per base. I always thought it was weird that there were different base widths in DBA, so I like the idea of standardizing. Oh I wasn't trying to make you feel bad! I was just curious. I expected it might be aesthetic or something even as mundane as "there were 36 figures in the pack..."
Tim, Painting fewer total models was a plus, and I do like the look of just 3 models on a base. Basing is so permanent (sure you can re-base, but that's a pain). So, now I'm just second guessing my decision. Do you have a particular post on your blog that discusses your decision to deepen your DBA army bases? If you click on the "basing" or "rules" labels on my blog you'll probably find a few post on the subject... Often I have written long prattling replies to comments when someone has noticed I'm using deeper bases and asked what was up with that. Basically I didn't like the look of the suggested bases - especially 4Bd - as it was rarely ever ranked up... a DBA army of 12 stands represents an entire army - the stands essentially represent units. A single thin line of 3-4 guys on a base just doesn't look like "unit" to me. Two ranks looks more like a unit of densely packed troops(to me at least). So, like you, it was purely an aesthetic choice. I should say - if "raiding party" is the look you're going for then definitely stick with the 3/base! My vikings I try to make look like they're in a shieldwall ready for action at Stamford Bridge or Fulford Gate! I wouldn't worry about it Andrew. 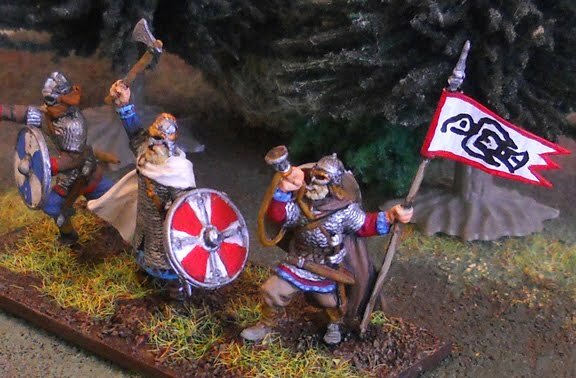 If I remember correctly in DBM Vikings are based 3 to a 30mm deep base to represent Bd(F) So they are quite appropriately based. Apart from the fact they look coool! Thanks. I never understood why the rules called for either 4Bd or 3Bd anyway. What's the point? I think it has to do with how they would have been classed in the old WRG Ancients games - the idea was so anyone who had been playing those wouldn't have to re-base their figures. According to DBM rule book 'The basing specified...is a simplified version of that used for WRG 7th and is also suitable for DBA.' The smoking gun. Also why a couple of the DBA lists have double-based elements despite DBA rules stating that double-basing is not used in DBA. I started double-basing pike elements, they fight as individuals but die together! A cheap set of DBM lists is handy as they contain a lot of supplementary information, as opposed to DBA which has none at all.